Lomborg: Renewables are stuck, although green hopes keep rising | Watts Up With That? Globally, renewables have been *declining* for the last two centuries, and have remained stuck at about 13% for the past 40 years. Actually, the UK set its record for wind power in 1804, when its share reached 2.5% – almost three times its level today! We need to get real on renewables. Only if green energy becomes much cheaper — and that requires lots of green R&D — will a renewables transition be possible. Hydro is a renewable resource. Are dams with hydroelectric power included as a renewable source in the graph? I know it’s not considered to be green. The reason renewable don’t work is Energy Density. 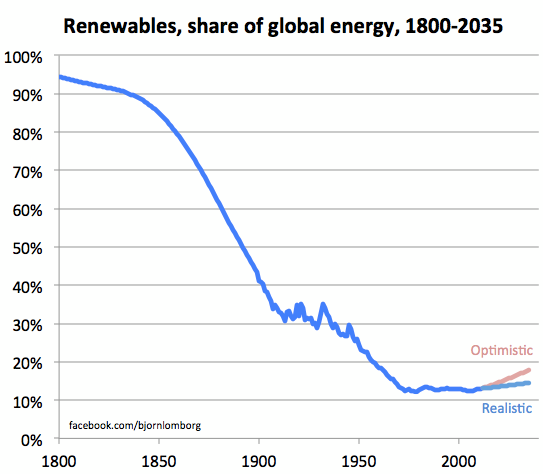 Actually , renewables go back a bit further than 1800 AD. Probably at least a few million years ago, when our ancestors clambered around in fig trees, with the monkeys, picking the fruit that appeared seasonally. They couldn’t sustain greater numbers of us back then, and it wasn’t until we discovered stored chemical energy, and how to access it (AKA fire), that our numbers took off. Renewables never got us to here, and they never will sustain us here. I do my bit. I heat my household with wood in the winters. Apparently, according to the Weekend Australian, Europeans are changing their chant about green renewable energy. Of course the fallacy about renewable power is that it is free. If ‘free’ why is it loaded with subsidies? Yes, it’s called material civilization… this graph could be the inverse of population growth and everything we associate with modern prosperity. 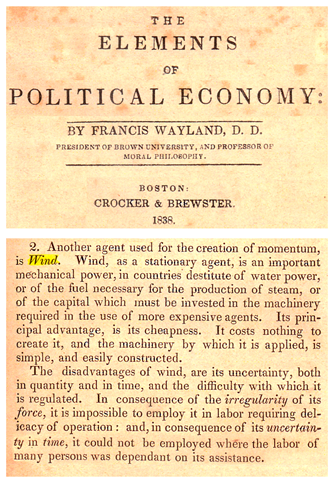 Why are we encouraged to only take energy generation back to the technology of 1800s? I don’t see green energy working at all, no matter how cheap they make it. It has to be cheap, that’s true, but it has to be efficient, also, and it just isn’t. Nuclear is renewable. Reactors can make their own fuel. Ed, house heating with wood causes such severe pollution problems that many urban areas have banned the practice. Hydro is not considered a renewable in the great Pacific Northwet State of Washington for the simple reason that you don’t get any federal money for claiming as newable anything you already built. As a result, on the windy bluffs above the Columbia River, source of renewable energy for generations to come to anyone else on the planet who wishes they had just half the dam energy we produce, our green governmental moronosphere is ushering in wind turbines. Oh – and filling the state coffers with tax dollars collected from as far away as Puerto Rico and Samoa. I have worked in alternative energy for 14 years. Only low cost feedstocks will ever work for any alternative to crude oil. This means coal, natural gas, and perhaps shale oil. Other energy sources are simply to diverse or they contain too little inherent energy to be used to produce any meaningful volume of fuel. It takes a ton of biomass to make 1-2 bbls of liquid hydrocarbon fuel. And the largest biomass plants will be 2000 tons/day operating 340 days a year. This amount of biomass will require harvesting roughly 100+ sq mi of arable land as a monoculture under contract for 30 years in order for any reasonable investor or organization to be willing to put half a billion dollars into that facility. In terms of cost per bbl/day, a refinery is probably less than $50K/bbl/day capacity. Biomass to hydrocarbon liquids (the only truly useful fuel) are $200,000+/bbl/day capacity. With biomass having about 7500 Btu/lb and coal over 11,000+, it is hard to compete with fossil fuel. If you factor in the risk of growing a crop (storms, drought, fire, etc. ), and the need to have very long term off-take agreements (30 years would probably be necessary), it is no wonder that there are essentially no cellulosic ethanol or other biomass to liquids plants in commercial production. Even the plant that rely on animal fat as feed are shut down as they cannot compete. now produced by the plant, since the plant is being operated at a lower output capacity. Such stoves are typically 70-80% efficient. GlynnMhor, tell that to the UK. Everyone is changing to wood pellets. They are even changing their coal electrical plants to wood pellets and buying the wood from the US. Yes, wood smoke causes pollution as Greece is finding out. People there cannot hang their wash on the line anymore. It dries black. On the subject of renewables, does anyone know how much PV would cost is the making of the solar panels using power from solar panels? Most of the cost of PV is the capital cost of the solar panels. Power for smelting all the materials used in making solar panels comes from coal at the moment at say $0.04/kWh. Large scale PV installations produce at a price of perhaps $0.20 per kWh under ideal circumstances. So in effect with solar panels we are making a one off capital investment at one power price in return for an intermittent supply at a higher price over a few decades. So if we had a society that lived off solar panels only, producing them and using them, what would be the power price in that society? China’s current plan is to have a Liquid Fluoride Thorium Reactor (LFTR) working prototype completed by 2020. When this happens, I think largescale wind and solar will effectively be dead. There will still be niche market for home solar panels as an expensive energy backup system, which may actually be fairly large given the rolling blackouts caused by impoverished countries (ie UK in the 70’s), but LFTRs will mark the end of largescale wind/solar farms. Basically, you switch a LFTR on and it’s self sustaining for 40 years. You just dig thorium out of the ground, purify it and burn it. It requires no special processing. One average rare earth mine produces enough “waste” thorium to provide the world of all its energy needs for a year…. Wind and solar are basically the horse and buggy industry of the 21st century. Wind is renewable. 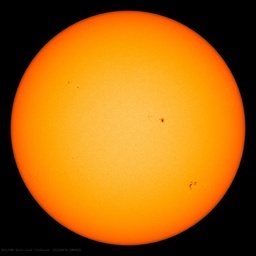 Solar activity is renewable. But wind turbines and solar panels sure aren’t. You know the old saying; Wish in one hand, crap in the other, see which one fills first. I would guess total amount of energy from renewables consumed per year has remained approximately constant since 1800, that is when compared to the total combined energy consumed per year. It’s amusing to see EIA tables now showing positive projections of wind and solar. Not long ago wind and solar were in the tank and projected to stay there. I guess the energy bureaucrats knew they have to show something else to keep their funding, that is a rosy picture of renewables gaining ground. Not a chance. The older tables were right. Oh… Almost forgot. After LFTRs heat inert gas to 1400C to spin gas turbine generators (no water needed), The gas leaves the turbines at 900C, so this “waste” heat can be used to desalinate sea water, chemically synthesize fertilizers and/or jet/diesel fuel for another revenue stream for the plant. Try doing that with wind/solar power. Like I said, neat stuff. He documents the futility of using renewables. Yet, at the end, he states the solution is to research ways to reduce their cost. News: that tech is far into the declining returns phase. Not going to happen. Chris and Eve, burning processed wood pellets in specialized equipment is one thing, but burning actual wood is quite another. Burning wood produces far more particulates, toxins, and carcinogens than does the burning of even coal, much less cleaner derived fuels. Renewable percentage of the total mix depends on the location, available resources, and policies. California generated 29.2 percent of its electricity in 2010 by non-nuclear and non-fossil fuel sources, including hydroelectric, geothermal, wind, solar, and biogas. Carbon trading via brokers including ICAP Plc (IAP) and GFI Group Inc. (GFIG) plunged to its lowest since at least January 2011 as banks scaled back buying and selling amid tighter regulation and a record glut of permits. The volume of EU allowances handled by six members of the London Energy Brokers’ Association dropped 61 percent in July to 84.1 million metric tons from a year earlier, according to an Aug. 8 report by the lobby group. Trading in Certified Emission Reductions, the United Nations-regulated offsets, plunged 81 percent. Activity on ICE Futures Europe in London, the biggest exchange for carbon contracts, slid 19 percent in the month. from Bloomberg, under the category “Wars on Things”! Fossil Fuels are the ultimate renewable – they go WAY back. LFTRs are completely different than Light Water Reactors (LWRs) as the don’t require any water to run steam generators, or cool the nuclear core. LFTRs don’t require any cooling as the liquid salts naturally maintain a heat range of 400C to 1,600C. LFTRs also run at single atmospheric pressure compared to 70 atmospheres required for LWRs, so there is no need to build expensive containment domes or water cooling towers. LFTRs have a passive/failsafe safety system that depends on gravity. As long as gravity works, LFTRs are safe. Thorium 231 is a fertile fission material that requires a neutron source to fission. If there is ever a breach in the liquid salt pipes, the liquid salts simply drains by gravity to a drain tank away from the neutron core, cools and become solid. There is no need for expensive back-ups of back ups of back ups required by LWRs. Gravity works just fine. Moreover, LFTRs convert 99% of thorium to energy as opposed to LWRs, which only convert 0.5% of U235 to energy before xenon gas degradation requires the fuel rods to be replaced. Accordingly, there is 200 TIMES less nuclear waste with LFTRs compared to LWRs and what nuclear “wastes” that are created are in high demand and can be sold at a profit. There are some nuclear waste materials but are very small and most of these have half lives of around 300yrs; many orders of magnitude shorter than LWR waste..
Samurai, Xenon 135 is irradiated and converted in the reactor to Xenon 136, which has a much lower neutron capture cross section. That’s what happens when it captures a neutron, it’s ability to capture another is degraded. And Thorium in a Thorium cycle reactor is not itself fissible, but is converted to U233 in the reactor, and it is that isotope that provides the energy. Since it’s still Uranium being fissioned, the LFTRs also produce Xenon at about the same rates. In most reactors about half of the U235 is consumed before the fuel needs to be replaced, though this varies depending on the initial enrichment concentration and the moderator’s efficiency and neutron capture cross section. BTW, the CANDU reactor can use the Thorium cycle without any equipment design changes. Spain now pays almost 1% of its GDP in subsidies for renewables, which is more than it spends on higher education. At the end of the century, Spain’s massive investment will have postponed global warming by 62 hours. Dr. Bob, Why do you not mention wood pellets? How do your numbers relate to Drax requiring 7.5 million tonnes per year from North Carolina. A 2,000 tonne per day plant cannot do that. So there isn’t a problem. Again, a LFTR was built and ran flawlessly for 5 years (1965-1969). It’s not a hypothetical idea. LFTRs work great. This is an excellent article and accurately portrays the real potential for renewables which is nil and the unnecessary problems will create especially for the poor. The only reason renewables are as high as they are is because of government mandates imposed by uninformed or agenda driven legislators and federal/state executive branch leaders. The cost of electricity is rising because many states are mandating renewable content and ethanol mandates are forced into the gasoline supply. Mandated % of renewable electricity generation is scarce and exchanges have been set up that force distributors to purchase electricity at exorbitant rates from rich investors (who received tax payer subsidies) who have often contributed to political campaigns. Over 60 cents per kilowatt hour is not uncommon for renewable electricity. In the case of gasoline cellulosic mandates are forcing gasoline blenders to use non existent cellulosic ethanol in the gasoline pool, besides the huge amounts of corn ethanol. Without such mandates the % of renewables would be a fraction of the present, nobody wants 19% or 15% ethanol in their gasoling . The big problem we have is that the politicians and MSM have blatantly been lying and misinforming the public to believe that a greater % of renewables is viable and realistic whereas Jim Hansen is correct in this case. James Hansen is absolutely right as far as the ‘renewables’ of wind and solar are concerned . For an excellent and well documented article of why this is, see: Lastganglinien als Erfolgskontrolle der Energiewende mit Windenergie- und Fotovoltaik-Anlagen (http://tinyurl.com/k5kvrmb). It is in German but the graphs are very easy to interpret: installed wind and solar (W+S) ‘nameplate’ capacity in Germany versus the actual kilowatt-hours generated and kilowatt-hours needed. The total installed W+S capacity in Germany is currently about the same as fossil+nuclear+hydro. The actual W+S kilowatt-hours are the ‘grass’ in the graphs at a fraction of what is needed. The last graph of the article (diagram 7) is telling, it shows the total W+S energy generated in Germany during the winter of 2012-2013 applied to actual use for Baden-Württemberg (one of the 16 states of Germany). At times the excess MWh generated by the ‘renewables’ is double the needed energy, however, at other times there is virtually none (the red areas in the graph). Increasing W+S, regardless of price, will make for higher peaks but without storage it does not change the hard truth that a backup system is still needed for the full capacity to supply power during windless/sunless intervals. This is all very much understood and it is difficult to believe that in a country like Germany with a stellar history of science and engineering, led by a physicist, could be stampeded into changing from fossil/nuclear to renewables (the vaunted ‘Energiewende’). Maybe a ploy to show W+S is a massively expensive pipe dream and have voters approve nuclear when reality sets in? Just in case anyone comes toodling along this thread who is ignorant about solar power and how very little it can do…. BACK! BY POPULAR DEMAND! It’s Ozzieeeeee Zehner! Glynn- CANDUs are a dead end. They require 70 atmospheres of steam pressure to run, and are still extremely inefficient in only converting less than 1% of nuclear material to energy compared to LFTRs, which convert 99% of thorium to energy. CANDUs also generate 200 times more nuclear waste per megawatt of energy produced compared to LFTRs and they’re much more expensive to build and run compared to LFTRs. They make no sense compared to the safety, efficiency, running costs and decommissioning costs compared to LFTRs. They can never be made economic, even with energy storage (which only adds to their cost). They are a waste of scarce capital and other resources desperately needed for other purposes. They are far more destructive to the environment than fossil fuels. They are a device for redistributing wealth from poor to rich. They are a pretext for more intrusive regulation and interference in people’s daily lives. “. . . postponed global warming by 62 hours. That would be based on the idea of CO2 being the driver of global warming. Any such number is rather meaningless because, while such a calculation can be made, Earth marches to a large number of drummers. A more appropriate statement would be that Spain’s massive investment will have, to the nearest whole number, zero impact on Earth’s climates. The phrase “stupendously stupid” comes to mind. Danke for sharing that excellent solar-wind power article (albeit in Deutsche). Yes, indeed, the pictures were “worth a thousand words.” “Grass,” indeed! Tiny little shoots of grass, lol. LOL, I scanned the comments and the name “Barth” caught my eye, “What are they doing talking about Barth? lol, got off topic just like we do here, sometimes, I suppose…” Then, I discovered it was one of the commenters. #[:)] Ich spreche keine Deutsche, but, I think I read someone making the point that solar does not work very well at night, heh, heh. Eike looks like a fine Truth in Science site. And my admiration goes out to you for your mastery of (at least) three languages (English, German, and, I think, your native Nederlandish (Dutch)). You hail from the country of one of my greatest mentors: Corrie ten Boom of Haarlem. OTOH the presentation is being made by a human being who is the result of a long-term solar engineering project begun by bacteria 2.8 billion years ago. I’d say humans are a very big accomplishment for organisms measuring a couple of micrometres in size. Just show me an organism engineered by humans that’s 10^6 bigger than a human! The reality is green R&D will do nothing and is waste of tax dollars. One could make cars lighter and as safe as current cars -that is possible and make a difference. Hydrates. This could be moderate government program or for not costing tax payers anything by improving laws regarding future Methane Hydrate mining. Give incentives towards mining it, which would encourage the private sector to do the R&D needed to get to point of commercial mining ocean methane hydrate deposits. Or little of both. We know have to lower CO2 emission. Nuclear power. Nuclear power mostly needs government to improve laws regarding nuclear power- better technology would developed if government was vaguely sane on the topic. source of energy and has much higher energy density than anywhere on Earth. No they don’t; they merely fail when used where they are inappropriate. Firewood provides me with space heating, hot water and most of my cooking for ~3 cents per KWHr, less than 10% of what I pay for electricity. I have a friend in NSW who uses PV electricity and battery storage because the cost of being connected to the grid was several times the cost of the PV array and batteries. Here in Oz we say: horses for courses. Energy density, and reliability (meaning when the sun doesn’t shine, the wind doesn’t blow, and reactors that over-vibrate their pipes [recent San Onofre episode], et al), are key. I would be interested in any documentation you can provide. “… begun by bacteria …” BEGUN BY BACTERIA? And just what (or who) designed those bacteria? Space aliens? Do you realize how much ordered complexity is in just ONE CELL? Do you seriously believe that all that complexity, much of it necessarily simultaneous, simply “happened” by “chance”? Before you say, “Yes! It is EASY for me to believe it happened by random mutations and random selection,” find out what the odds are that such random, non-directed, processes could create a mammal (the whale) that lives in the sea (evolutionists say its ancestor was a land, air-breathing, animal). When you find out those odds, and realize what a very IM-probable chance it would be of the roulette wheel’s turning up 17 that many times, you might (just might) pause and…… think about it. No? Perhaps, another time, then. No doubt you will angrily tell me to jump in a lake, but, in the slight possibility you genuinely want to learn more about Intelligent Design Theory (don’t confuse implications of it for evidence for it — it does not require you to believe in God or even in a god), let me know. I have lots of good reading and videos you might find helpful. Anyway, I hope you are enjoying another good book with a cup of your premium Darjeeling. DON’T WORRY, EVERYONE, I WON’T KEEP ON DEBATING ID THEORY. While I’m a fan of LFTRs, I think some of your expectations are overly optimistic, especially the reprocessing to fish out the U233. It’s certainly easier than reprocessing fuel from U235 reactors, but it’s still mucking about with stuff you want to careful with. Fluoride is not a gas, it’s an ion. Fluorine is a gas. Fluorine is also nastier than chlorine, you really don’t want to be anywhere near a fluorine leak. > Again, a LFTR was built and ran flawlessly for 5 years (1965-1969). Five reactor years is hardly a safety record, and they shut it down for the weekends. It also wasn’t a 600 MW reactor. Scale up brings many interesting effects. However, it is certainly a technology that we should have developed. Once the Chinese work out a few of the kinks, it should be a big seller for them. A reverse engineered E-Cat may be the bigger seller though…. > CANDUs are a dead end. They require 70 atmospheres of steam pressure to run…. Umm, if you’re going to run a turbine, what pressure do you want to start with? > LFTRs don’t require any cooling as the liquid salts naturally maintain a heat range of 400C to 1,600C. Exactly how do you get 1600&degC salt to spin a turbine? There are some challenging engineering properties there! The ORNL reactor never dealt with high pressure, high temperature materials because their goal was to study the reactor, not produce electricity. Check out http://daryanenergyblog.wordpress.com/ca/part-8-msr-lftr/ . The author seems to down on all forms of nuclear power, but at least he seems to give things a fairly decent analysis. 17,000 dead, hundreds of thousands homeless due to the tsunami. And yet we worry about something that didn’t hurt anyone. If Intelligent Design isn’t on the WUWT banned list, it should be. Too much room to argue, to little space for improving understanding of the world. Lomborg is discussing total primary energy supply, not just electricity supply. As of 2011, California gets around 6% of its primary energy from renewable sources. Clean, green CA is a renewable energy embarrassment, at less than half of the global average of 13%. “DON’T WORRY, EVERYONE, I WON’T KEEP ON DEBATING ID THEORY. I mean no disrespect Janice, but I think that is a subject best-suited for another forum. On matters here, I do often find your commentary thought-provoking. I accept your statement and look forward to your opinions. I respect what you say. If there is a such a ban on talking about ID, I would very much appreciate it if pro-Darwinist Evolutionary Theory comments were also banned. It makes it so hard to just shut up and take it when nearly every DAY someone casually advocates Darwin’s Origin of Species ideas. I hope you can understand me even though you don’t agree with me. And, believe it or not, I refrain from about 90% of the ID comments I think of! “Not enough, not enough,” I can just hear you say grimly. LOL, okay, okay. I’ll try harder. Bottom line? It’s A-th-y’s site and I will abide by his rules even if they turn out to be one-sided. This is such a GREAT SITE! I love coming here. Thanks, again, Mr. Werme, for all your great tips for formatting (and lots of other tech tips you give us from time to time). Here in Australia we have an organisation called Beyond Zero Emissions who have produced a paper claiming we can run the whole of the country on a range of renewable energy systems. Australia basically runs on 18 -20GW of coal baseload power supported at peaks of 25 – 27GW by Hydro and Gas. They propose we get 60% of our power from Solar thermal power stations running on molten salt to give 24hr operation – that becomes our baseload power……..need I go any further? These guys are in fantasyland yet they continue to get funding, they pat each other on the back and are now telling us we can run a high speed train from Melbourne to Brisbane entirely on this new renewable energy grid they fantasise about. I got so frustrated by their antics I sent them an email and may I suggest others do the same. “When are you guys going to come down from your fantasy and admit to the Australian people you have lied to them? Your solar thermal proposal in the Beyond Zero Emission paper has turned out the be a complete lemon – the company that produced your base load power station of 200MW still hasn’t produced one – the best Abengoa Solar has done is 100MW for 3 hours and they didn’t tell you they use gas for the rest of the day and they use gas to melt the salt in the first place otherwise they couldn’t produce power until after midday if they used the tower to melt the salt. You and your insane ideas are holding this country back – we have abundant supplies of coal and gas and we could have the cheapest electricity in the world which could attract industry and create jobs yet your influence over the gullible has convinced them that your flawed theory is true. I hope the new Coalition Government closes you down as you are a blight on the intellectual landscape. BTW – what do we do for power on a calm evening? Sigh. I will try to do better at refraining. I would not have even mentioned ID theory, I hope you realized this, but for Mr. Pompous’s slightly grandiose assertions of engineering done by bacteria above. Perhaps, you read my post to Mr. Werme just above. I do realize that this is no place to debate any issue such as ID. That is much better done in person. Debate by written correspondence is herding cows through a London traffic circle. Thanks for not being angry with me for my lapse. I’ll try to save my arguing for CAGW matters. Mr. McClennEy — please forgive my misspelling your name. Time to go to bed….z zzzzzzzzz. If I remember correctly, you are a fellow tarheel. Not to worry, even if I have erred in this regard. Always remember, no one can offend you. Only you can delegate the power to be offended to someone else. One should only rarely choose such an option. To save engineering and manufacturing costs. The simple cell layer that holds all the rods and cones together isn’t as transparent as the nerves and blood vessels that feed them. In kitty cats the layer’s even reflective, so it goes behind everything. If you’re looking for real disproof, try Washington, D.C. I rather thought it was a forbidden topic. And I did not intend to invoke it. My remark was quite jocular. There actually is a lot of space for improving understanding of the world. Unfortunately, the debate is too polarised — even worse than climatology. Your disproof doesn’t work. The designer might be very intelligent, but clinically insane. Or even merely incompetent. Bob, thanks for those facts on alternative fuels. Can you direct me to a place where I can get a paper with that info in it? I want to hand it to someone who needs something official-looking, not a blog post. Again, thanks. No, I will not angrily tell you to do anything though feel free to jump into a lake if that pleases you 🙂 It is after all summertime where you live. It’s entirely probable that I know as much, or more, about evolutionary theories than yourself. I have read very much in this area from Michael Behe, Richard Dawkins, and Stephen Jay Gould through to Simon Conway-Morris. Not to mention Kim Sterleny who rather resembles me, not me him! The title of my blog: “One Long Argument” is a quote from Ernst Mayr a rather famous evolutionary biologist. If you wish to “educate” me, I may post something you can respond to in the next 24 hours. Any such debate does not belong on Anthony’s blog without a specific invite from him which given his areas of interest is unlikely. I will be more inclined to follow through on this if Dr Roy Spencer had some input. He from all accounts is interested, intelligent and has a wicked sensa yuma! To save engineering and manufacturing costs. So cephalopods maximised engineering and manufacturing costs? For interest this is only about 7 family cars in volume. Tough job admittedly. Yet this gets us nowhere. You won’t add light to any topic (ceratinly not renewables) by discussing Intelligent Design. But you will add a lot of heat. Besides, you don’t need to believe in Intelligent Design to doubt that bacteria designed anything (the comment that originally offended Janice Moore). That does imply an intelligence in genes that isn’t entirely Darwinian, either. That’s true, but what’s shown there is primarily a cookstove, so it lacks the secondary combustion chamber and side-feed at the bottom that make the heater-type rocket stove so efficient and smokeless, which was the criticism of wood heating that I was responding to. I guess the next step will have to be for rocket stove designers to provide a larger, more convenient surface for cooking. I did not set out to discuss intelligent design, or offend Miss/Mrs/Ms [delete whichever is inapplicable] Moore. She originally stated “Just in case anyone comes toodling along this thread who is ignorant about solar power and how very little it can do….” and I pointed out that solar energy over 2.8 billion years had resulted in a progression from bacteria to humans. That’s a very long way (IMHO) from claiming that bacteria are intelligent, or knew that in 2.8 billion years there were going to be televisions, the Internet and rampant drug-use in China! I would have thought on a blog where science is the order of the day, stating the empirical evidence was… well… uncontroversial! If you have any evidence that there were no photosynthesizing bacteria on planet Earth 2.8 billion years ago, please share it with us. If you have any evidence that humans do not currently exist, again, please share that evidence! For the record, I am not an atheist , or a true-believer in god/gods/goddesses/shamans/witches [delete whichever is inapplicable]. Rather, I am an agnostic; I believe there is insufficient evidence to form an opinion. I am not a true-believer in Intelligent Design, nor do I believe the neo-Darwinist account of evolution. Over 30 distinct species of plants randomly discover C4 photosynthesis in the blink of an evolutionary eye? Give me a break! Just as Dante’s hell has multiple layers: Green hell has multiple layer: There is deficit hell, job loss hell, brown out hell, no change in CO2 emission from the spending on green scams hell, planet is and will cool not warm hell, CO2 increase is beneficial to environment not detrimental hell and so on. When engineering reality concerning green scams is ignored, lies are told about the ultimate cost of the green scams, lies are told about the green scams scheme’s ability to actually reduce CO2, lies are told about planetary temperature change, lies are told or unintentional consequences are ignored and covered up (the very best example is the food to biofuel scam which will result in people in developing countries starving, food wars, and all the virgin forest on the planet being cut down if the US, China, and India copy the EU): there are consequences. The consequence is all logic and reason is removed from public policy: Thereby forcing trillions and trillions of dollars to be spent, mandated by government policy on green scams. The green scam cost will triple or quadruple the cost of electricity if there is actually an attempt to significantly reduce CO2 emissions with ‘green’ scams rather than to just spend money on green scams that do not work. Green energy is a super duper example of an “Extraordinary Popular Delusion” and “the Madness of Crowds” which will bankrupt Western countries, result in massive job losses, and will result in massive power failures if we mandate CO2 emission cuts, cap CO2 emission, tax CO2, and so on. i.e. Actually attempt to significantly reduce CO2 emissions (say 40% reduction leading to 60% reduction) using green scams rather than spend trillions of dollars on green scams and make no significant change in CO2 emissions. A minority of fanatic green parties have stopped nuclear in its tracks which will work. Rather than investing research into a scheme which will work, we are wasting trillions of dollars on green schemes that will never work to reduce CO2 emissions (which is not a problem as the world will cool) even if money grew on trees and deficit spending was not going to lead to currency collapse and economic chaos. Problem 1: Massive construction of high voltage power lines are required, including very, very expensive AC to DC and DC to AC convertors for super high voltage long distant lines. 30% of the energy generated is loss in transmission losses. Problem 2: If storage is not constructed there will massive rotating power outages. Money does not grow on trees. Western countries will go bankrupt if they attempt to construct storage in addition to losing the last manufacturing jobs to Asia. Wind is the go to renewable. Wind illustrates the problems with so called green energy. German wind farms produce power that averages 20% of the nameplate capacity of the wind generators. Unfortunately there are days and times of the day when wind power farms produce 0% and 100%. Wind power is at the cube of the wind speed there hours when wind farms produce from 5% to 30%, from 30% to 90%. Every time wind power varies so called fossil fuel plants must be turned on/off/on/off/on/off to balance the grid. Due to the in efficiencies to turn fossil plants on/off/on/off/on/off there is almost no net reduction in atmospheric CO2, if honest CO2 accounting is done. This is madness. The scheme does significantly reduce CO2 without storage. Problem 3: Green energy does not reduce significantly reduce CO2 emissions if honest accounting is done. Double the cost of electricity and reduce CO2 emissions by 5% to 10% if storage is not installed. We need to be reminded what happens in major city when the lights go out. Chaos, crime, back to the stone age. One interest in my life that is of primary importance is the cooking and consuming of food accompanied by fermented grapes. I purchased my Bosky cookstove 2nd hand several years before commencing building the house. Q: “how do you get 1,600c liquid salts to turn a gas turbine? A: with a heat exchanger that can heats up an inert gas. Q: Fluorine is a dangerous gas. A. Yes, it is, but it’s in a closed system at 1 atmospheric pressure. It’s all about risk management and chemical companies deal with dangerous gases all the time. My objection to your statement (and from a different angle, also Janice Moore’s objection) was to the idea of design by bacteria. That photosynthesis can be performed by bacteria is not questioned. But that bacteria designed man is wrong. Sorry about that. You worded things very badly. That renewables cannot meet the energy demands of a modern society is seen has a ‘opportunity ‘ by those that oppose the modern society in the first place . The greens push this idea , while attack other sources of energy generation, because they know it does not work. Therefore , can only lead to want they want in the first place , massive energy shortages. All resources that are in present existence are free. It is only the price of extraction and conversion to something of more use that is not free. Coal and oil are both free. It is there in the ground ready for us to harvest just as wind is in the sky and available to harvest. In the case of coal, it costs money to dig out of the ground, transport it to the power station where it is burnt to generate electricity. But the resource itself is free. The cost of generation is not, although it is far cheaper than generation from wind. Of course, obtaining power from wind costs money. Wind is free but getting energy from it is not. The costs associated with the manufacture of turbines and errecting of windfarms is expensive and then they produce energy inefficiently (usually about 22% to 28% of nameplate capacity) and they are intermittent, variable and unreliable which means balancing the grid is difficult and expensive and in the end does not reduce CO2 emissions (the back up gas generators not working at optimum efficiency and here in the UK standby diesel generators produce as much CO2 as would otherwise be saved by the wind turbines such that in overall terms there is no saving in CO2 emissions). Hopefully people will soon see the renewables for what they are, namely an expensive folly; inefficient and not reducing CO2 emissions. When people are extremely cold and hungry and the ‘ruling elite’ has seen fit to remove all sources of energy for warmth and cooking, the people will NOT go looking for clever low emissions wood stoves and wood pellets, they will burn anything that will burn and eat anything that they can catch and cook. This is not an idle academic argument, the UK is shutting down power generation at a rate that even the power company CEOs are saying will lead to power outs for UK in winter. The EPA in the US is doing precisely the same thing and will create precisely the same effect for the US with severe impact on those states where survival depends on energy. It would appear Germany may have at last understood the problem but they too may be too late. The Malthusian greens and their eager politician supporters are on a roll that will not end prettily. That’s almost true. Sadly, the miners of coal, hewers of wood, carriers of water etc are taxed for their efforts to improve our lot. I seem to recall a post on this very website in the last few days where it is alleged that Spain is imposing a consumption tax on sunlight! The Git has memories of seeing his first corpse back in the UK in the 1960s. She was a midwife riding her bike on her way to deliver a baby in Nuneaton. There were several old age pensioners on the Git’s paper round who had put bricks in their fireplaces to reduce the amount of fuel needed to keep a fire burning. Frozen to death by the intense cold. It wasn’t pretty then, and it’s not pretty now. And inverting that graph will show you the relative index of life improvement during the course of weaning ourselves off of renewables. Sums up the whole problem in one simple correct sentence. Biofuels are crippled by thermodynamics. If they alone were to be used to provide the energy needed to transform low energy-density carbohydrates into high energy-density liquid hydrocarbons there would be essentially zero energy gain. Instead they depend 100% on fossil fuel at every single step in the process- Fertilizers, mechanized farming, fermentation, distillation, refining and transportation. Without this “fossil fuel crutch”, biofuels become the equivalent of an impossible “green” perpetual motion machine. Government policies that subsidize biofuels to meet hypothetical “targets” are actually driving further deforestation & harming world food production. The end result is that they actually rob the world’s poor to reward the rich. Chris has answered your post above. It is even worse then what Chris said. Whilst your statistics is true for electricity generation, it is not acknowledging the problems the so called renewable create. Allowing a source to “inject” current whenever it can produce creates bigger net fluctuation than it would be without it. This decreases the efficiency of the other energy sources that need to be available and compensate. As you can see natural gas is a high component in the table. How much is it through efficient plants that extract 60% and more energy and how much through “backup” for the so called renewable with only 40% output? Is this “success” not also a reason why many industries are forced to leave California? “Green” energy is polluting more – see biofuels, see pellets and wood burning, see energy savings lamps (CFLs) and their disposal and so on. Why? . Does it has something to do with people refusing to acknowledge the problems that these industries cause and forcing their implementation by all means? Success then, as that is the intended end result. Your UK Figures are wrong. On wednesday wind was generating 0.3GW which is 1% of UK summer needs or 0.5% of UK winter needs(60GW). The trouble is that it is varying all the time making it near impossible to balance the national grid without losses in gas efficiency. Note the flutter of excitment in the graph (though still declining) between 1900 and the late 40s. The very first solar panels were invented by Charles Fritts in 1883. They were improved upon with the use of silicon in 1941 by Russel Ohl. Compare the progress with automobiles, airplanes and space flight of this wondrous technology. Good catch Lars, let’s take away the green’s abominated dwindling hydroelectric power and what have we got in the “Greenest state in the land of the free” (its Kentucky in the song but…). Why, acceptable renewables is 14.6% of electrical power IN CALIFORNIA! Sowell uses the shallow “hide the decline” method to cheat and obfuscate often used by those he admires. “Communications” (the misappropriated word of sneaks) are the key, still not aware that he is in awesomely sharper company than he thinks exists in the world. Com’on Rodge, think outside of the California box you are in. Wind power flucuates slowly. If a turbine fails then you lose at most 8MW from the grid. Spinning Reserve National Grid pays to keep a number of large power station generators partly loaded. Pumped Storage Pumped storage as in Dinorwig Power Station is also used in addition to spinning reserve to keep the system in balance. Frequency Service For large perturbations, which can exceed the capability of spinning reserve, NG (National Grid plc) who operate the national grid and control the operations of power stations (but does not own them) has a number of partners who are known as NG Frequency Service, National Grid Reserve Service or reserve service participants. These are large power users such as steel works, cold stores, etc. who are happy to enter into a contract to be paid to be automatically disconnected from power supplies whenever grid frequency starts to fall. Standing Reserve Operating closely with NG Frequency Response is the National Grid Reserve Service now called STOR or Short Term Operating Reserve. NG Standing Reserve participants are small diesel engine owners, and Open Cycle gas turbine generator owners, who are paid to start up and connect to the grid within 20 minutes from the time Frequency Response customers are called to disconnect. These participants must be reliable and able to stay on and run for an hour or so, with a repetition rate of 20 hours. National Grid has about 500 MW of diesel generators on contract, and 150 MW of gas turbines with about 2,000 MW of disconnect-able load. Sources of intermittency on the UK National Grid The largest source of intermittency on the UK National Grid is the power stations; in fact, the single largest source is Sizewell B nuclear power station. Whenever Sizewell B is operating the entire 1.3 GW output is liable to stop at any time without warning. Its capacity is 2.16% of the national grid maximum demand, making it the single largest power source and therefore the largest source of intermittency. Despite this issue, NG readily copes with it using the methods outlined above including the use of diesel engines. An industry-wide rate of unplanned scrams (shutdowns) of 0.6 per 7000 hours critical means that such a shut-down without warning is expected to happen about once every year and a half. However, no matter how low the rate of unplanned scrams, this is largely irrelevant – what matters is the fact that it can and does happen, and measures have to be in place to deal with it. Your data on how much windpower is supplied to the UK grid at a specific time and your response to Lars P miss the point; viz. Windpower provides no electricity of use to an electricity grid supply at any time. Windfarms operate intermittently: they only provide electricity when the wind is strong enough and not too strong. Thermal power stations are needed to provide ALL the required electricity when the windfarms are not operating. And when windfarms do operate then the electricity they produce forces thermal power stations to operate at reduced output. This – as Lars P said – reduces their efficiency. And the reduction in efficiency of thermal power stations INCREASES their fuel requirement (the effect is similar to driving a car at 5mph in fifth gear: it can be done but it uses a lot of fuel). When [thermal] plant is de-loaded to balance the system, it results in a significant proportion of deloaded plant which operates relatively inefficiently. Coal plant will be part-loaded such that the loss of a generating unit can swiftly be replaced by bringing other units on to full load. In addition to increased costs of holding reserve in this manner, it has been estimated that the entire benefit of reduced emissions from the renewables programme has been negated by the increased emissions from part-loaded plant under NETA. (NETA is the New Electricity Trading Arrangements of the UK’s deregulated energy market). Windfarms are environmentally damaging, polluting, bird swatters that only produce electricity some of the time and provide no electricity which is useful to an electricity grid supply at any time. But they add large cost to electricity supply. Their adoption and use is supported by subsidies and enforced by legislation. The subsidies of windfarms and the legal enforcement of the use of windfarms should be removed. The blood vessels are in front of your retina so that you freak out when trying to climb trees in the dark. Bacteria knew this would be bad for your survival and designed accordingly. You can see them pulsating. Ick. For the record, fairly agnostic. I think solar is great, I get most of my energy to my house from solar heat collectors and a smaller PV installment (1,1 kW). A tile stove supplements heating in december and january. A small pack of batteries evens out generation/consumtion patterns. Of the 30 000 kWh I use, I expect to buy 4000 next year. Installation cost have been 15000 USD approx. Allow 20 years write of and I get more than 100 000 USD back on my investment of 15000 USD over 20 years (assuming the rate of 23 cents per kWh). Solar is and should be a local affair – where the use is close to the source and offsets grid usage at better than grid parity price. Solar can liberate a family from the grip of energy companies and politicians alike. What is not to like? The only way that renewables work is if it is installed at the point of consumption with battery storage capacity and energy efficient technolgy. The problem with the current renewable push is they are trying to make it applicable to the “grid”, and it just can’t work that way. We will never be able to sustain the grid with renewable energy. Thus, as I said above, the best hope is to install renewable at the point of service and hopefully decrease the demand on the grid. Thank you for your kind words Janice! From a practical point of view, green energy is a day-dream. The paltry amounts of green energy produced now rely upon costly subsidies which benefit large, rent-seeking corporations and well-connected political donors. You can’t have a discussion with somebody who thinks that way. It’s an emotional, unreasoned argument. In addition to Richard’s post have a look at the power generated from 7000 thousands of wind turbines combined. Weather is consistent over high areas and the energy generated varies with the cube of wind velocity. You are talking about a single turbine failure, but that is irrelevant – the fluctuation come from thousands of turbines combined. Even in winter there are unpredictable periods of zero output from wind. Balancing the grid is a nightmare if net wind capacity increases much further. Renewables will not be useful until we find a way to store the energy, otherwise we’ll always need a fossil fuel plant to step in when the wind stops or the sun is behind clouds or at night. Which means they are more use for applications such as illuminated road signs than attempting replace regular AC generation. When it comes to any form of power grid things get more complex the more generators are involved. Without energy storage renewables just increase energy costs double triple or more. The only current technology capable of a sensible amount of energy storage is pumped hydro. Maybe wind driven mechanical pumps sending water to the upper reservoir would be useful. Indeed. The key to the future is obtaining the energy we need from somewhere other than the limited supplies available on this particular rock (3rd from the sun). The amount of materials and energy available in the rest of the solar system dwarfs our meager supplies here. Hydro is the major player in the renewable numbers (over 60%). Wind is small at about 2% and solar is almost nonexistent. ….Renewables never got us to here, and they never will sustain us here. A cut of 80% of CO2 emissions (Obama and EU goal) without 100% conversion to nuclear power puts us back into the 1800’s or even the 1700s without the technology, training and small population that allowed a peaceful civilization. The change from horses to tractors was just happening from 1945-70. In 1940, 58% of all farms had cars, 25% had telephones, and 33% had electricity. If the USA reduces its energy consumption by 80% it equals 45.18 million Btu. per person. Without nuclear power it dumps us back into the 1700’s because the manufacture of wind turbines, solar panels and such requires mining and smelting of ores. Very high energy processes that were normally done with COAL or earlier with coke. The Warmist idiots have ZERO concept of the amount of energy necessary to fuel civilization and seem to think it is run on Pixie dust and Unicorn farts. They also have a kum ba yah view of primitive cultures and turn a blind eye to the genocide that runs side by side with misery, illiteracy, and a daily struggle for survival. Only a well filled belly make humans civilized instead of predatory. Pointman’s essay brings this home. Please read it. ….This erosion did not start in the Balkans, where previous military action in Bosnia was taken in accordance with UN Security Council resolutions, but in Somalia after the withdrawal of a tragically unsuccessful UN peacekeeping mission. A serious acceleration of this process has recently occurred in Central Africa, where it has been accompanied by a dramatic erosion of human rights that seriously puts at stake the credibility of the international community to impose the respect of a new international order based on universal human rights principles. The series of conflicts from the Great Lakes region to Angola, which has uprooted several million people, is gradually destroying the achievements of more than three decades of development efforts; entire populations are sinking back into misery, inter-ethnic violence, illiteracy, and a daily struggle for survival. But while this political and humanitarian disaster has gone largely unnoticed by the international media, it is worthwhile to consider the unravelling of the Central African crisis from the Rwandan genocide to the regional war in the Congo basin in the light of basic principles of international law. It will have a severely destabilising effect on the geopolitical structure of Africa, and probably on the structure of international relations in general…. Fukushima didn’t kill anyone so they have to come up with another scare story. Renewable percentage of the total mix depends on the location, available resources, and policies…. The rollout of smart electric meters across the country has run into a few snags: one woman doesn’t want one, and ended up in the dark as a result. You might not think that would be an issue. But it is, because Duke Energy is now beginning to disconnect any homeowner who refuses a new electric meter. Other electric companies are not pulling the plug…yet…..
… With smart meters, CenterPoint Energy is proposing to add a process prior to shutting down whole circuits to conduct a mass turn off of individual meters with 200 amps or less (i.e. residential and small commercial consumers) for 15 or 30 minutes, rotating consumers impacted during that outage as well as possible future outages. There are several benefits to consumers of this proposed process. By isolating non-critical service accounts (“critical” accounts include hospitals, police stations, water treatment facilities etc.) and spreading “load shed” to a wider distribution, critical accounts that happen to share the same circuit with non-critical accounts will be less affected in the event of an emergency. Curtailment of other important public safety devices and services such as traffic signals, police and fire stations, and water pumps and sewer lifts may also be avoided. And the Department of Energy Report that show Obama’s Administration has had this planned since he took office. A smart grid is needed at the distribution level to manage voltage levels, reactive power, potential reverse power flows, and power conditioning, all critical to running grid-connected DG systems, particularly with high penetrations of solar and wind power and PHEVs…. Designing and retrofitting household appliances, such as washers, dryers, and water heaters with technology to communicate and respond to market signals and user preferences via home automation technology will be a significant challenge. Substantial investment will be required…. But that was an experimental reactor rather than an actual power plant. No doubt we’d have to both relearn things and work with regulations which didn’t exist 50 years ago. With all the subsidy money going to the likes of wind, which is literally a prehistoric technology. …..The greens push this idea , while attack other sources of energy generation, because they know it does not work. Therefore , can only lead to want they want in the first place , massive energy shortages. The USA now has a class of people who have been raise to think the rest of us ‘Owe Them’ (their interpretation of Marx) and from personal experience I can tell you that if they are not allowed to steal what ever they want they will react with rage. Turn off their supply of easy money and energy and you are going to have a real explosion. Why do you think the Department of Homeland Security is nattering on about homegrown terrorists, local police are arming themselves like the military link and the Department of Homeland Security is alleged to be buying 1.6 billion rounds and 46000 rounds are hollow point rounds, ammo that has been illegal in international warfare since 1899. CANDU power plants already exist and we know how to build more if needs be. By comparison there are no LFTR power plants operating anywhere in the world. Until there are all the numbers are just theoretical. See graph on page 2, from International Energy Agency. Worldwide Power produced via renewables is expected to surpass power from natural gas by 2016. How’s that for thinking outside California, Gary Pearse? Nothing to dislike Avfuktare the problem starts when someone want to force the other not so lucky to have a good spot, to buy any excess in energy produced, at double price and also ask for money to finance it from the beginning. @ Kees van der Pool, you are so very welcome. My pleasure. Not that it appears to be of concern to you, but, in case… I was not offended by you; I merely could not resist the urge to refute. I will refrain in the future (I hope!). Given your remark, I’ll leave it to Roy Spencer or someone whose intellectual abilities you respect to answer any questions you may have in the future about ID. Yes, I realize you have no questions at this time. Gail Combs, thanks for your kindly advice. I do not consider ID a religious issue per se, but, I am definitely going to avoid discussing it on WUWT. Every day the grid handles a power change of 14GW over a couple of hours this is a lot more taxing than a slow changing wind output. It causes no problems. Lose 1 GW of nuclear and all hell breaks loose. And when windfarms do operate then the electricity they produce forces thermal power stations to operate at reduced output. This – as Lars P said – reduces their efficiency. And the reduction in efficiency of thermal power stations INCREASES their fuel requirement (the effect is similar to driving a car at 5mph in fifth gear: it can be done but it uses a lot of fuel). Efficiency is not the measure you sholud use- a power station generating 1 watt to supply 1/100watt is not efficient but it doesnot burn much gas. When an electric vehicle capable of towing my caravan 400 miles with a ten minute recharge is available, then I will believe that most problems have been overcome. Until then green energy will only be subsidised pixie dust. Yes, home solar and wood are perfectly workable and practical renewable applications. The failure is applying them to the grid, as others have pointed out, and perhaps I should have made that clear. Disagreements on matters like intelligent design would best be put aside so that everyone focuses on the most important objective we all have in common, to stop the AGW madness and save the planet – yes, save the planet! – from the greens and their counterhuman crusade. I don’t happen to accept intelligent design, but I couldn’t care less whether a fellow AGW skeptic does or doesn’t. My concern is that we are all united in the effort to stop the madness and the murder. Things like intelligent design can be discussed at leisure – stopping the onslaught of green slavery doesn’t have that luxury. The only reason they want to use renewables is their unshakeable belief that carbon dioxide is warming up the world. It so happens that this is completely impossible because the greenhouse effect alleged to cause that global warming simply does not exist. Just take a look at our atmosphere today. Carbon dioxide is at the highest level it has ever been but there is no warming. It is completely unable to call forth that greenhouse effect that IPCC, Al Gore, James Hansen et al. have ceaselessly told us about. Just none. And today is not an exception – that so-called “pause” or “hiatus” of warming has lasted for 15 years now and there is no end in sight. Remember that IPCC was established in the year 1988, the same year that Hansen gave his famous talk about the global warming ahead. Ten years later, in 1998, warming simply stopped. That stoppage has lasted for 15 years now, five years longer than they were able to see any warming in action. This should be reason enough to consider that the so-called “pause” in warming should be declared the new normal for climate science. And the warming they did claim to see before it stopped in 1998 was not greenhouse warming either. There were two periods of warming before 1998: the “early century warming” from 1910 to 1940 that raised global temperature by half a degree Celsius, and the “late twentieth century warming” in the eighties and nineties. The early century warming demonstrably could not be greenhouse warming because it had a sudden start but there was no corresponding sudden increase of atmospheric carbon dioxide. Laws of physics do not allow greenhouse warming to start unless atmospheric carbon dioxide simultaneously increases. That is because the IR absorbance of carbon dioxide is a property of the gas and cannot be changed. If you want to start a warming you must increase the number of absorbing molecules and this did not happen. That “late twentieth century warming,” on the other hand, did not even happen. Doing research for my book “What Warming?” I discovered that it was a total fraud and said so when the book came out in 2010. Strangely enough, nothing happened for two years. Then, late last year, I accidentally discovered that GISTEMP, HadCRUT, and NCDC had all given up showing that warming and were aligning their data with satellites where the warming is absent. This was done secretly and no explanation was given. I consider this coordinated action tantamount to an admission that they knew the warming was phony. This takes care of the two major warming periods before 1998 that IPCC has been pointing to as part of global warming. Clearly there has been no greenhouse warming in the past and its absence for the last fifteen years brings it up to date. The absence of the greenhouse effect follows from the Miskolczi theory of the saturated greenhouse effect that was published in 2007. He was shouted down in the blogosphere but no peer reviewed objections have been published for the last seven years, no doubt not for lack of trying. In 2010 he found a way to prove it directly using existing data. It was made possible by the fact that NOAA has a database of weather balloon observations going back to 1948. Miskolczi used it to study the absorption of infrared radiation by the atmosphere over time. And discovered that the absorption had been constant for 61 years while carbon dioxide at the same time went up by 21.6 percent. This means that the addition of this substantial amount of carbon dioxide to atmosphere had no influence whatsoever on the absorption of IR by the atmosphere. And no absorption means no greenhouse effect, case closed. And without that greenhouse effect there is no anthropogenic global warming that IPCC was set up to study. This leaves it nothing to do and it should be closed down forthwith. When the taxpayer is forced to subsidize something, you tend to get more of it, whether you want it or not. Remove the subsidies (a la Tesla) and see how much energy from renewables you get. Don’t have any problem with private capital funded renewables making a profit, without taxpayer subsidies. You omitted to include the further inconvenient fact that just when manmade CO2 emissions began to rise signifcantly, ie., late 1930s, rather than warming being observed, global temperatures cooled until the late 1970s. This fact is also inconsistent with there being any significant GHE resulting from increased levels of CO2 in the atmosphere. Again suggesting that by the 1930s any GHE brought about by CO2 was by then fully saturated by the levels of CO2 existing in the 1930s (since this is before ML measurements, and since the chemical analysis methods are disputed, and question marks hang over ice core data for the recent past, I will leave the reader to consider what level of CO2 was present in the late 1930s). Windpower changes rapidly when a weather front moves over the UK. Weather is consistent over high areas and the energy generated varies with the cube of wind velocity. You have ignored that and repeated your silly talking point. sergeiMK, you are talking nonsense! 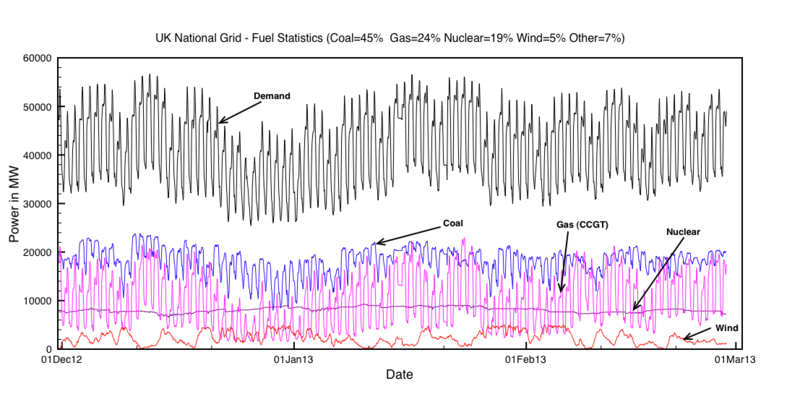 Reduced efficiency is the critically important problem of using windfarms as a supply to an electricity grid. I explained this to you in my post which you have replied. In other words, windfarms do not reduce fuel requirement of electricity generation, do not reduce emissions from electricity generation, but do add cost to electricity generation. And this is because addition of windpower to the grid reduces the efficiency of thermal power stations which have to operate for supply to the grid at all times. Your answer suggests building and using ADDITIONAL and EVEN LESS EFFICIENT thermal power stations (they are less efficient because they do not operate combined cycles). Simply, you are suggesting attempting to reduce the effect of an act of stupidity by adding to that act of stupidity. I note you did not mention my recommendation that the subsidies should be removed, and I wonder why. I have twice tried to post a reply to sergeiMK but both attempts have vanished. I hope they have gone in the ‘bin’. If so then please retrieve the first of them. I shall be absent from the web for some time which is why I made the repost and why I am posting this message. Renewables can’t work to meet our current energy needs, we all know that. Fission is good, fusion is better, and the best form of energy is to harness the gravity well of the universe itself. Malthus will eventually be right if a species requires the total energy of the universe to sustain itself. Currently, I think ants are closer to that than we are. Indeed, I’ve often thought it’s an ants world and we just live in it. Regarding ID, what better adaptation could there be than a species optimized for rapid mutation to meet new conditions?